It is time for small manufacturers to enjoy the same benefits of larger ones, yet keeping the software simple! Over the last several decades, you as a manufacturer limped along with software for your invoicing and financial side. However, never found the right, user-friendly, affordable software, that would help you manage your manufacturing operation. The available manufacturing products were complicated, required significant investment, and implementation effort. The generic entry level products could not help you with manufacturing. 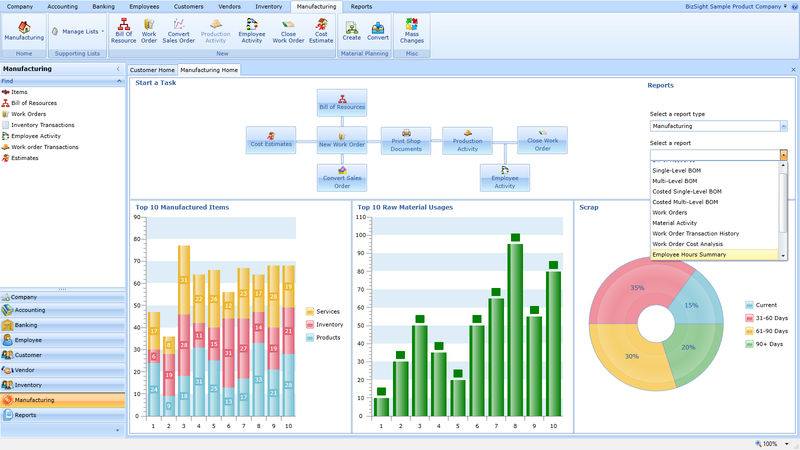 BizSight Manufacturing is designed around the small business, where a few do a lot, where the software can be quickly deployed, and the same easy to use software is available to accounting, customer service, purchasing, as well as manufacturing! You can create estimates, create/convert work orders, print travelers and picklists to your floor, manage your inventory, track labor, plan material purchases (based on existing demand and supply in the system), track scrap/rejects, and even compare actual costs to plan. 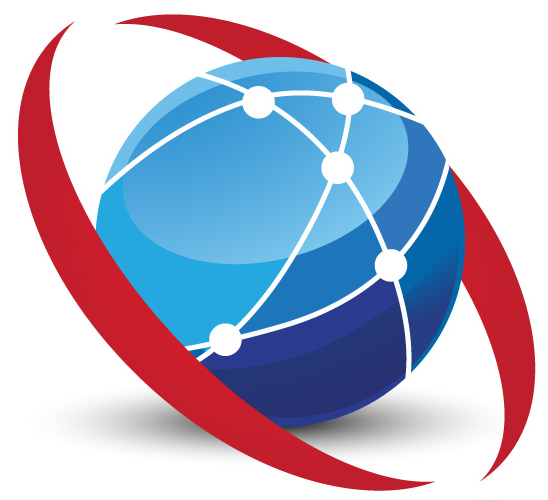 Our browser-based product can be run on a single machine or on multiple machines over a network. It helps eliminate the multiple installs companies tend to have and allows users share information over a network across one of the browser (Internet Explorer, Fire Fox, Chrome, or Safari). You decide if you want to run this on your premise or in the cloud! 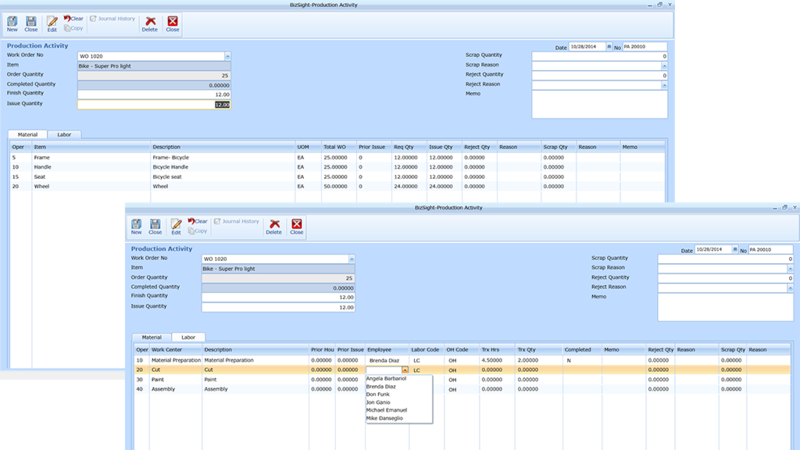 Creating and managing work orders is the heart of managing your manufacturing process. 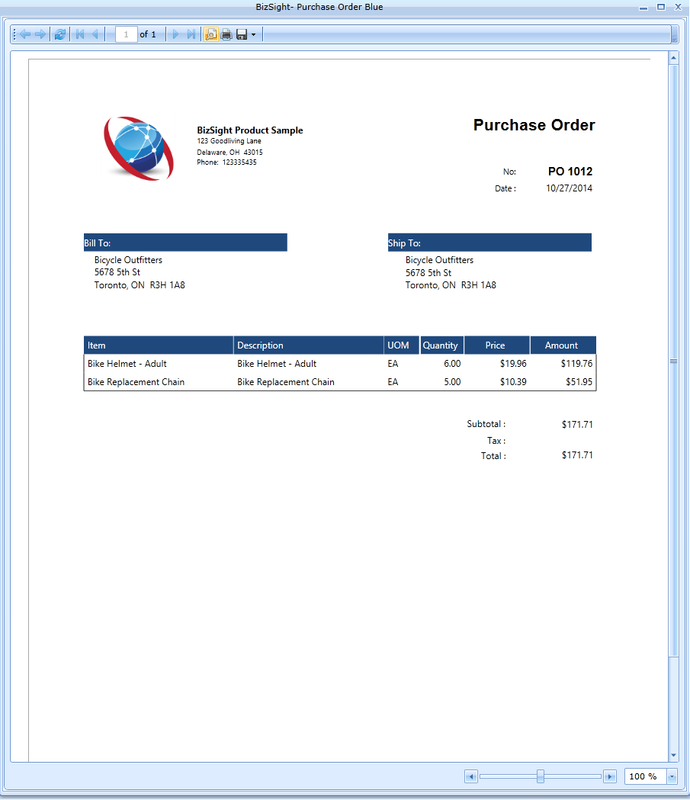 BizSight Manufacturing gives you the flexibility to create work orders from your items, sales orders, estimates, or from a material plan. 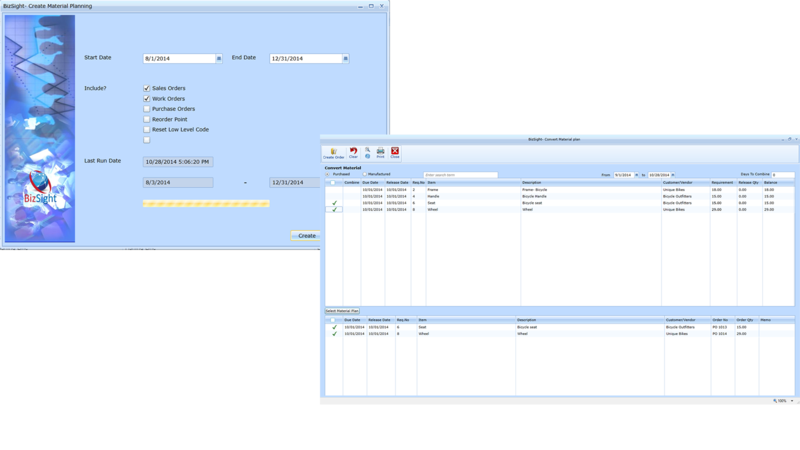 Work orders draw from a Bill of Resource that manages a combination of your bill of material (BOM) and operation steps. 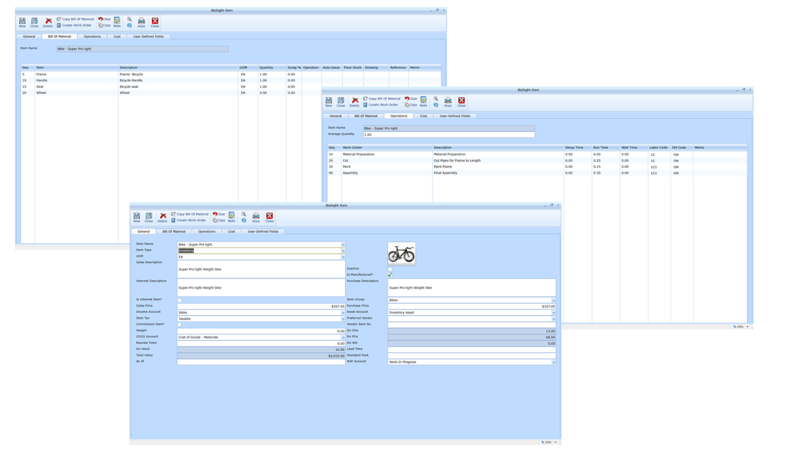 A customizable traveler can be printed as documentation for the work order which includes a pick list for material and the operation steps that need to be performed with the necessary instruction. Start and due dates can be scheduled using simple backward, forward, or manual scheduling accommodating your typical manufacturing lead times. Planned material and labor activity is summarized on the work order providing a quick status. 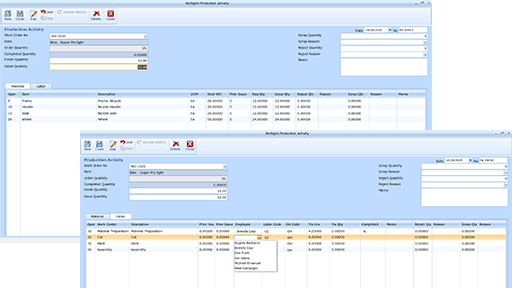 The Bill of Resource within BizSight Manufacturing is an extension of your inventory item and is the core to your manufacturing. Additional component material and operation sequence information used in the manufacture of an item can be added here. 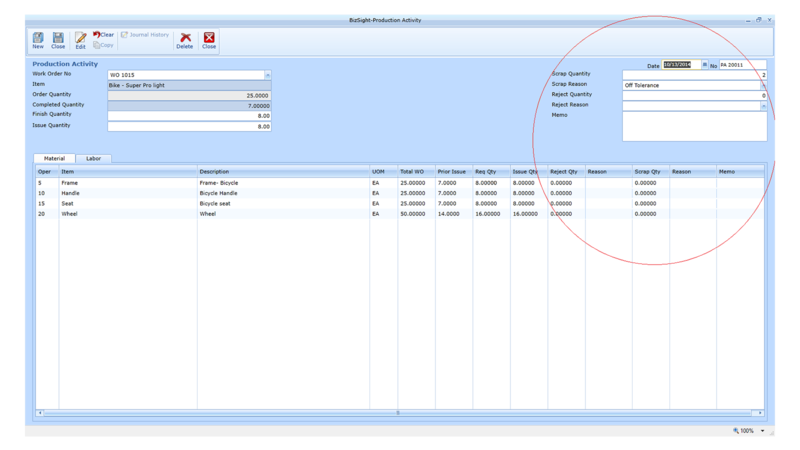 This information is a combination of a traditional bill of material (BOM) and routing that is typically defined to manufacture an item-all in one easy-to-define step. You can define and manage just material, operations, or both. This gives a small business the flexibility to start by just managing material or expand this to both material and labor. Production activity is the recording of activity against a work order which allows for the tracking of material and labor. This also results in the adjustment of inventory quantities from material issues,receipts, and the corresponding journal entry in the accounting side. Production activity is reported taking either a work order focused approach or using a traditional employee time sheet approach. Both approaches adjust inventory quantities for material that may need to be issued or conversely, put away into inventory. 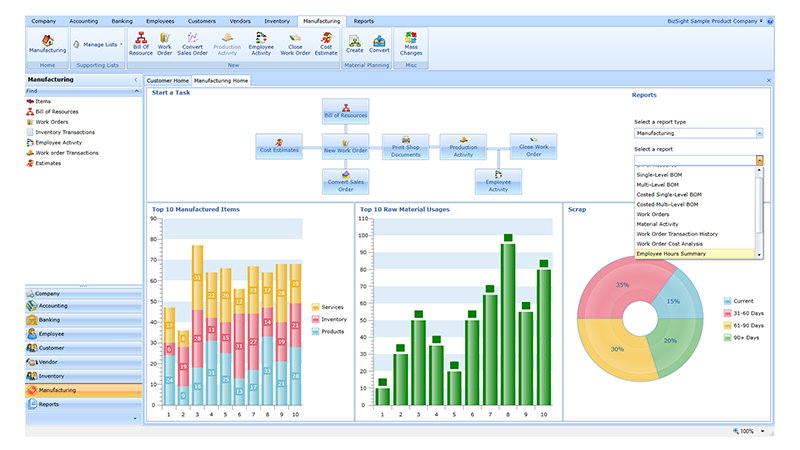 Production activity facilitates work-in-progress tracking as well as a detailed operational and cost analysis. In addition to material issues, scrap and reject quantities can be tracked. As these scrap and reject quantities are reported, specific reason codes can be assigned to them. Reports with this information allow you to identify problem areas that need to be addressed with the material and or the manufacturing process. Material planning, at the simplest level, is the process of looking at the demand from your customers, evaluating what you have on-hand, factoring in your committed and planned replenishments, then evaluating your resulting inventory needs. BizSight Manufacturing does just that and recommends when and how much to make or buy. Using our Convert Material Plan, the user can take these recommendations, make changes to them, override, consolidate, or ignore them. 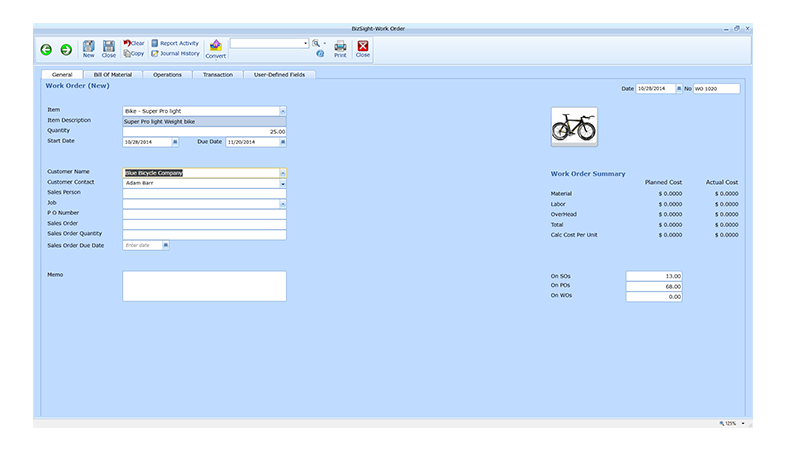 The resulting quantities and orders can then be converted into purchase orders or work orders with just a few clicks. 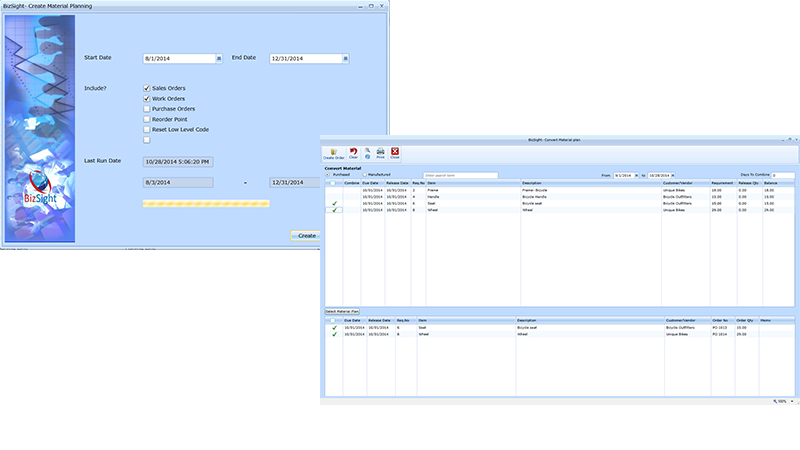 There are nearly 20 different reports with drill-downs and the ease of adding or removing columns to be printed. In addition to the drill-down to information, they give you the flexibility to export this information into Excel for further analysis and charting. Smaller businesses are often at a clear disadvantage to their larger competitors. They don’t have the same budgets to purchase the support software they need to effectively serve their customers and maintain fluid operations so they can stay in business. At BizTechnologies, we have created small business manufacturing software designed to keep your manufacturing company in the game and ensure you can compete with the larger manufacturers out there. 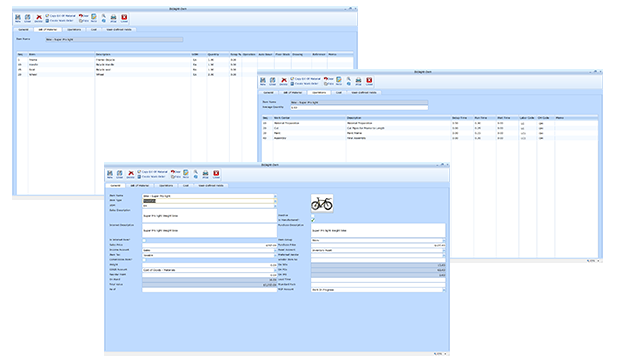 We have designed small business invoicing software with you in mind. We understand you don’t have a large staff and typically have a few people who handle everything. For this reason, our manufacturing software for small business was created to launch quickly and to offer intuitive controls so your staff can quickly learn and implement it into your daily operations. Our goal was to give you access to all the features larger businesses enjoy without the hassle of other software solutions. We keep it simple so you can spend a majority of your time on other important aspects of running your business. 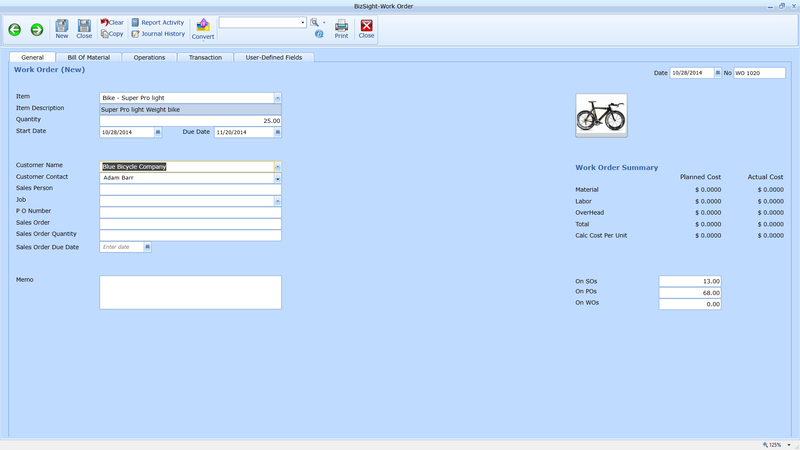 The best feature of our small business manufacturing software is it can be accessed via any browser. This means you can run it on just one machine in your business or several. All of your employees will be able to quickly and easily access the information they need to get their jobs done right the first time. This gives you a competitive edge with your customers, helping to maintain a loyal customer base and attract new ones.